My Plumber Heating and Cooling announced this week that they would be participating in National Wreaths Across America Day at Arlington National Cemetery. We are pleased to participate in this wonderful event. We hope to encourage others to get involved as well. My Plumber Heating and Cooling announced this week that they would be participating in National Wreaths Across America Day at Arlington National Cemetery. The Northern Virginia-based company will donate 200 wreaths and volunteer at the event. On December 16th, 2017, wreaths will be laid on the gravesites of fallen soldiers at over 1200 locations around the world. Volunteers at the event are encouraged to say the names of veterans out loud and thank them for their service. This helps keep the memory of our veterans alive. My Plumber Heating and Cooling is encouraging individuals as well as business owners to donate and volunteer at the event. 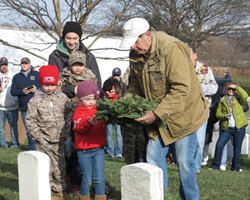 Wreaths Across America offers several ways to get involved. Interested parties can sponsor wreaths, volunteer at the event, donate to fundraising efforts, start a fundraising group, offer corporate support, provide trucking support or share the organizations mission and experiences. More information about National Wreaths Across America Day can be found at their website at http://www.wreathsacrossamerica.org/. My Plumber Heating and Cooling is committed to serving their community. The company volunteers and donates to several local community causes. My Plumber Heating and Cooling holds internal fundraisers and offers community education. They also sponsor several local community teams and events. My Plumber Heating and Cooling offers comprehensive plumbing, heating and air conditioning services in Northern Virginia and Suburban Maryland. Their skilled technicians are well prepared to handle a wide variety of plumbing, heating and cooling problems. They utilize the most up-to-date technologies and techniques to provide exceptional service to both their residential and commercial customers. Their work is fully backed by their 100% satisfaction guarantee. For more information about My Plumber Heating and Cooling, please visit https://www.myplumber.com.